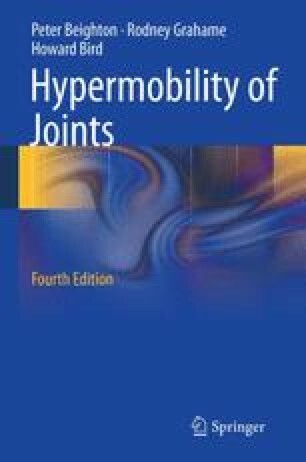 The heritable hypermobility syndromes are a group of disorders in which joint laxity is a prominent feature. In some of these conditions, the loose joints predispose to a wide variety of articular complications and, despite their rarity, they are of considerable rheumatological importance. Wenstrup R, De Paepe A. Ehlers-Danlos syndrome, classic type: reviews at Gene-Tests-GeneClinics [database online]. Available at http://www.geneclinics.org, 2010. Levy HP. Ehlers-Danlos syndrome, hypermobility type: reviews at Gene-Tests-GeneClinics [database online]. Available at http://www.geneclinics.org, 2007. Pepin MG, Byers PH. Ehlers-Danlos syndrome, vascular type: reviews at Gene-Tests-GeneClinics [database online]. Available at http://www.geneclinics.org, 2006. Yeowel HN, Steinmann B. Ehlers-Danlos syndrome, kyphoscoliotic form; reviews at Gene-Tests-GeneClinics [database online]. Available at http://www.geneclinics.org, 2008. Dietz HC. Marfan syndrome: reviews at GeneTests-GeneClinics [databse online]. Available at http://www.geneclinics.org, update 2005. Steiner RD, Pepin MG, Byers PH. Osteogenesis imperfecta: reviews at Gene Tests-GeneClinics [database online]. Available at http://www.geneclinics.org, 2005.